Every man that holds to himself owns at least the most basic tools for working around the house. While any box can be used to store these tools, it is much better to have a bag or a box that is specially designed for that purpose. In this way, you will have the tools well organized, easy to find and avoid dragging a cardboard box full of old tools around hoping it will not fall apart. 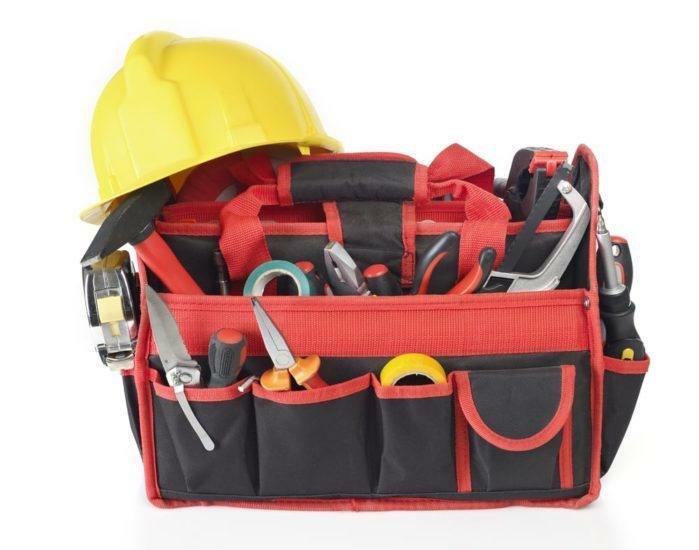 The best tool bags are portable, well organized and not so expensive- so every handyman or enthusiast who likes to repair things around the house, can certainly afford one. In order to help you choose the best deal on the market, we have comprised a detailed guide that will enable you to recognize the best tool bag when you see it. Furthermore, we took the next step and found five best tool bags available that you can choose from according to your personal preferences. 19.9 x 16.3 x 11 inches / 19 lbs. 11.9 x 5.1 x 9.9 inches / 1 lb. 16.5 x 9.5 x 20.2 inches / 9.2 lbs. 9 x 16 x 9 inches / 3.5 lbs. 11 x 7 x 6 Inches / 1.5 lbs. Why buy a tool bag? What to consider when buying a tool bag? A tool bag is a reliable place to store and transport the tools you own wherever you need them. It keeps the tools well organized and always right there at your fingertips, which allows for less stressful work and no more misplacing tools you need. Tool bags are essential for professional handymen, and construction workers since they must have their tools at hand wherever they are but are also highly practical for every person who owns tools. Best tool bags have plenty of pockets, comfortable handles for easy carrying and they give you a professional look which is especially important if you use the tools to make your living. When your potential new customer or client sees you with the tools well organized in a stylish tool bag, he or she is more likely to perceive you as a methodical and responsible person always on top of things and hire you for the job. Best tool bags are made to be durable and easy to carry, have a great storage capacity and many different pockets to keep various tools organized, but also look stylish. Compared to tool boxes and cases, tool bags are lighter and more practical for use in the field. The first thing you should consider is how many tools you have or plan to have in the future as the tool bag’s primary purpose is to be able to fit your ever-increasing collection of tools. The size of the bag, but also its organization, can help you determine if the specific bag will be able to answer all your needs for a long time. You do not want to choose a larger bag than you really need as that will also mean more weight to carry. Weight is of particular importance if you work in the field, as carrying heavy and large tools is hard enough without the bag adding to it. As already mentioned, the organization is a major factor in judging the quality of a tool bag. Depending on the organization structure, you will be able to store more tools in a better way. You want a bag with a wide mouth opening and many different compartments and pockets, properly sized for the tools and accessories they are intended to hold. Best tool bags have numerous pockets that vary in size: big ones for power﻿ tools and smaller vertical for the hand tools. Small pockets you can close, or zip, are practical for little accessories like screws and nails. Bags can also have hooks and clips for items such as a tape measure and D rings for attaching various tools. The D rings are characteristically sewed into the fabric with reinforced stitching. The durability of the bag mostly depends on how strong the tool bag material is. If the bag is made from a material that is thin or weak, the bag will not last long. The materials most often used are canvas and nylon; molded plastic is used for hard sides. The lid can have a metal frame stitched into the fabric which would allow for it to stay up while loading the tools. The foam should line the interior safeguarding the tools and accessories from breaking when shaken around. You also want to make sure that the material of the bag can withstand all the weather conditions. It is best to consider a bag that is waterproof and/or weatherproof as it will not get easily ruined when exposed to the elements. Heavy duty fasteners and zippers also add to the durability of the tool bag. If they are of poor quality, or weak, they will easily break off and become unusable. Choose heavy, durable fasteners and zippers that seem able to withstand extreme use. Another feature that makes a tool bag sturdier is a reinforced bottom panel as it prevents the tools from tearing out the bottom and makes the bag more stable when set down. Feet on the bottom help avoid the wear and tear as they keep the fabric off the ground and prevent its damage. As the tools are heavy, the bag should make it easier for you to carry them around. Do not choose a bag that is larger than you need as both size and weight influence portability. Smaller, handheld bags should have a comfortable, but also strong handle. Larger bags can be really heavy when loaded, so it is preferred that they have a padded, wide and sturdy strap that will help support their weight. The strap can be removable too. Another option available is a wheeled bag which makes moving from place to place much easier. The wheels carry all the weight and you do not have to worry about getting strained or worn-out. Most wheeled bags have retractable handles that are often telescopic and height-adjustable for greater comfort. All the features already mentioned add up to account for a good design of the bag. A tool bag which is designed properly is both practical and good looking. As far as the style is concerned, it mostly depends on your personal preferences and sense for esthetics. No one wants an ugly, bulky bag. It goes without a question that you should like the model, style and even color of your bag, but make sure that these aspects do not override other important features and specifications. As getting value for your money is always important, you should balance the two. In most cases, you get what you pay for, and you cannot expect the same quality and functionality in different price ranges. However, sometimes you pay for the brand too, and could perhaps get a similar product from a less known manufacturer at a lesser price. If you are going to use your bag rarely, you do not want to empty your wallet and then have it sit in the attic and collect dust most of the time. If on the other hand, you are a professional and will use the tool bag in the field on a daily basis you cannot afford to be thrifty. The Klein Tradesman Pro Organizer is a wheeled tool bag that features 6” wheels able to handle all types of terrain. Its weight capacity is 200 pounds- 100 pounds inside the bag and the other 100 pounds stacked on its top. The telescopic handle which extends to approx. 38 inches, is strong enough to carry the burden so that you do not have to worry about straining- until you reach the stairs. It is made of durable 600D ballistic weave, and the lid is reinforced with a metal frame which keeps the bag opened to load or unload tools easily. This bag offers 24 pockets to organize all your tools, But the inside pockets are fairly shallow as they do not go to the bottom of the bag. The orange interior is a nice design touch since it makes all the tools highly visible.It is a high-end bag, a bit pricey, but suitable for professionals as it offers both looks and quality. On the downside, the bag has a distinctive smell probably coming from the rubber wheels which might bother some people. Stanley STST70574is a budget-friendly tool bag suitable for small and medium-sized hand tools. The fabric seems durable, and the two small ergonomic hand straps are cotton padded and designed to make carrying the bag comfy. It is visually appealing to the extent that you might even replace it with an ordinary bag. On the outside, it features three pockets on each side; the middle one is bigger and has a velcro flap. Inside, the bag also has three pockets on each side that are velcroed together. Another well-thought feature is a rubber foam bottom section which safeguards the tools from damaging and hard falls and provides sturdiness. Outer mesh pockets are great for storing some personal belongings. The company guarantees the quality with limited lifetime warranty, which is great considering the price. On the downside, the zippers seem to be of poorer quality than the rest of the bag so be careful when closing a full bag. It is a good enough bag to hold your tools for work around the house but not for a heavy duty tool kit, so make sure that it will satisfy your needs before buying it. Veto PRO PAC tool bag has an enormous storing capacity that makes it an excellent choice for professionals who use tools on a regular basis. It holds up to 100 hand tools and enables you to always be prepared for whatever task at hand. It features an incredible 67 differently sized pockets, most of them designed for storing tools vertically. The two storage bays of the same size open on each side of the tool bag for easy access to your tools. A patented panel with mounted vertical pockets separates these bays. Four small pockets on the outside, have zippers to safely hold tiny accessories, like screws and nails. All the zippers are heavy duty, and we do not anticipate any problems with them in a reasonable time. The fabric seems strong, and the nylon stitching should also be able to hold up to heavy use and last a long time. The bag is also waterproof and comes with an extra wide padded shoulder strap. It is an expensive bag but comes with a 5-year warranty that provides assurance that it will last long. Custom Leathercraft 1539 features a total of 16 pockets to easily organize all your tools and accessories. A center compartment is the largest, and you can keep your large power tools in it, there are also some separate outside compartments suitable for hand﻿﻿ tools. The pockets on the sides are vertical making your tools visible and at hand at the same time, but they can fall out easily which might lead to losing them. The plastic tray in the middle is well designed and functional as it holds a good amount of things. You can adjust the size of the sections for different size items which is very convenient. We only wish that both bottom and sides are better reinforced as the bag collapses when the tray is removed. We do not anticipate any major issues with this bag as it is well designed and made of durable materials. However, we had some minor problems with a zipper which, although very strong, tends to stick from time to time, especially when the bag is fully loaded. Its price is in mid-range, and for the money spent you also get a 30-days money-back guarantee. Rothco Mechanics Tool Bag is a budget-friendly bag made of heavyweight cotton canvas. It comes in seven different colors you can choose from to best fit your style. It features two outer snap pockets for smaller tools and eight inner pockets, offering a large storage capacity suitable even for larger hand tools. The nylon zipper seems heavy-duty, and two center handles durable. The material can be printed on which is especially interesting if you own a firm. It has a kind of sturdy fiberboard sewn into the base and thus the bottom holds all the weight without distorting the shape of the bag. It is a durable bag suitable for storing basic tools, but not to be exposed to the elements much as it is not waterproof. On the downside, buttons on side compartments are hard to close and the zipper hard to pull which may be annoying at times, especially when in a hurry. Furthermore, the inner pockets are quite shallow and when you place the tools in them, and the bag is not fully loaded, they tend to collapse over towards the center of the bag and block access to the bottom. All the tool bags reviewed are of high-quality and built to last- but there is always one that is the best even among the best. In this case, we give our vote to Veto Pro Pac Mo﻿﻿del XL ﻿﻿﻿tool bag as we have found it to be almost faultless and well worth the money. If you do not wish to break the bank though, or simply need a more basic tool bag, we recommend Stanley STST70574 tool bag – the budget friendly bag which offers durability and a lot of storage for way less money. The Best Jack Stands That Every Vehicle Owner Should Know! How to Remove Shower Drain: Follow These Easy Steps!